Even though we moved into our home almost three years ago, I’m still trying to work out several of the spaces. We’ve gone through a lot of changes in the past few years, and had to move things around a lot: a new baby, new business, and design add will do that to you! Because of this, one of the main walkway walls downstairs has gone untouched – literally – since the day we moved in. 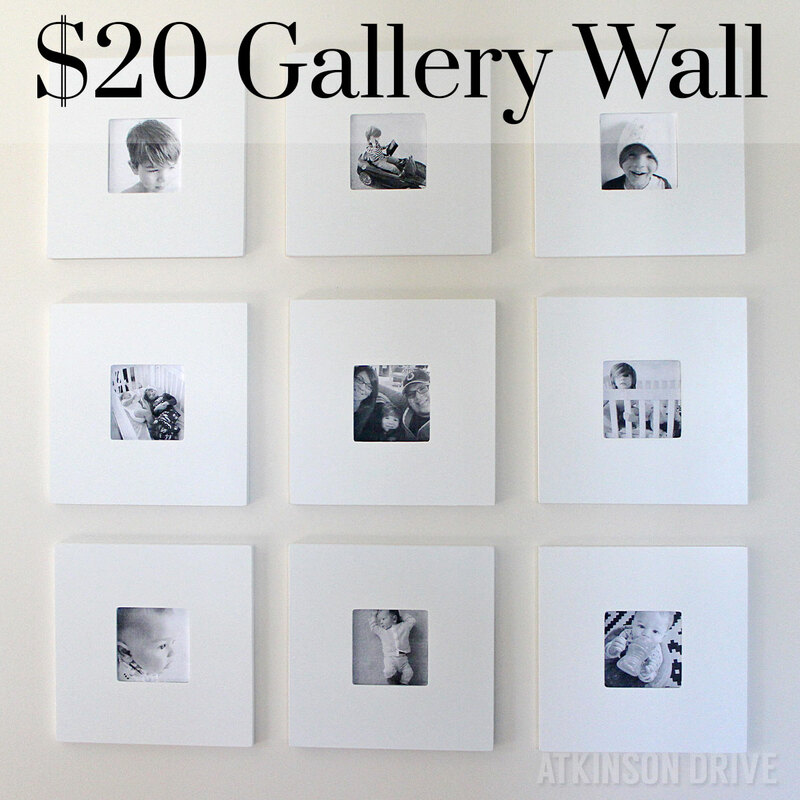 Finally, enough was enough, and I came up with this simple and affordable black and white gallery wall! I love the way it turned out! I am a fan of anything black & white. Thank you for linking this party up at Outside The Box. Thanks! I’m with you – black and white is my current obsession! I didn’t actually take the mirrors out at all … I just put the photos right on top! And Mod Podge is basically glue. It’s made for crafting to be a glue / sealer / and top coat with various finishes. There are links in the post to see the IKEA mirrors and Mod Podge listings on Amazon if that helps! What size picture fits the opening? I can’t find a place to print the pictures on photo paper so I’m going print them at a cvs just smaller can the mod podge be brushed over the picture that’s not a photo paper printer ? I just used regular printer paper! I have a couple of those mirrors laying around–what a wonderful idea! I love a good Ikea hack AND gallery walls so this project is awesome. Thanks for sharing! Genius idea! Thanks for sharing. What is the size of the opening on the mirror? What dimensions did you use when printing your pictures? Thank you for sharing this. I’m always looking for affordable ideas with big impact. It looks fabulous! I am so going to do this as well!! Already bought the supplies now only need to select the pictures! Thanks a lot for this great idea/tutorial budget friendly!! Thank you so much – I hope you love it as much as we love ours!! This is awesome! Thanks for sharing. Looking forward to doing it myself. Perhaps this is a silly question, but how did you print your Instagram photos from your computer? Was it through the Instagram webpage? I love this idea for our upstairs hallway, but can’t find the mirrors online. Any pointers ? Your best bet will be to go to IKEA. It doesn’t look like you can purchase them on their website. I know Amazon has them sometimes but they’ll likely be much more expensive. Will I have enough with the 8 ounce bottle of mod podge for this project or do i need the 16 ounce bottle that you linked? There’s plenty in the 8oz bottle! Possibly a silly question, but this is my first DIY project…so I was wondering, did you use the Matte finish or the glossy finish Mod podge? I used glossy, but you could use either! Sam I am so in love with this idea. I found it on Pinterest, ran out the next day to Ikea and put this gallery in my bedroom. I shared my pics at work and now everyone is running out to do the same. I think the black and whites just make the whole gallery so elegant. I am featuring this amazing idea on my blog this week. Thanks for sharing your genius and creativity! Can’t wait to try this in my dining room! Wish I could see the frames from further back, have you posted any more pictures seeing these from a distance? Thanks so much for the idea! Thanks a lot for this great idea. I just found your project via Pinterest and had to pop over to check out how you managed to create such a cute wall at a fraction of the price. New blog follower, pinning now. Love this idea and so easy too! I’m definitely doing this in our hallway with pictures of our new grandson. So glad I opened my DIY Projects World Newsletter today! Can I ask you how you fitted to wall, did the mirrors come with wall hanging supplies. Just want to know how you hung them? These look awesome! What a great idea! I’m going to have to find a place to try this in my house. If you’re getting air bubbles, it’s best to just try and gently push them towards the edges using your fingers. That should work! Hello! Thank you for the great idea. I have purchased my mirrors and cut all of my pictures, but have run into a hiccup. I purchased Mod Podge (gloss) and the Mod Podge foam brushes, and was disappointed to see that the Mod Podge leaves a streaky film over the pictures. It is very noticeable. Do you have any tips for application? I am wondering if it is maybe the foam brush I used that is causing the streaking. What did you use to apply the Mod Podge on top of the pictures? Thank you for your help! There will probably always be some streaks, but it should go away after drying so it’s not as noticeable. I use foam brushes for application. You said in a prior comment that you used the glossy modgepog! I think that’s why she purchased the glossy. Anywho, have you been able to prevent dust or clean the dust since there is no barrier between the pic? I just dust occasionally using a swiffer and they’ve held up fine… No fingerprints to clean off glass! Is it possible to remove the pictures after in case you want to display different pictures? Loved the idea, found it a couple of days ago. I already did it and I think because I used picture paper it sort of turned the pictures a bit vintage. But I kind of like it. Yes picture paper can act differently when you put stuff on it – but that’s good to know! I did one full layer and then kind of touched up where I felt like it needed more. Just make sure if you do more than one layer that you let it fully dry in between or it’ll stay tacky forever! Love this! What spacing did you use between the frames? And is the spacing the same vertically and horizontally? The link in the article to the mirrors has gone belly up. Are the mirrors that you linked to named MALMA? Hello,I found your great wall art project on Pinterest. Wow, Amazing job!!! I am thinking of making a fabric/textile art project and your project seems great to fit my idea. I have a very silly question to ask you. Is the back of the mirror fram separable like a regular photo frame? or is it securely closed all around? Glad you found it! The mirrors are actually glued into the back of the frame … so you may be able to remove it and re-glue it though I’m not positive. Hi, thank you for inspiring me to do this, how did you hang the frames on the wall? I just used some of those itty bitty nails that come in picture hanging sets. There are holes in the back of the mirrors that make it really easy! Just so you know — inspiration for this one still going strong. I don’t have an IKEA near me so I practically begged my brother to bring me 20 of these when he comes to visit soon. I’m super excited. Thank you so much for the great idea. Cannot wait to do the gallery wall in our new home next month!!!!! What wall paint color is that .? Lovely ideas and it look great thank you for ideas and sharing.